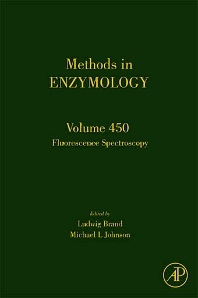 Fluorescence spectroscopy is a type of electromagnetic spectroscopy, using a beam of light, which analyzes fluorescence from a sample. Given its extremely high sensitivity and selectivity, it is an important investigational tool in many areas including material sciences, analytical sciences, and across a broad range of chemical, biochemical and medical research. It has become an essential investigational technique allowing detailed, real-time observation of the structure and dynamics of intact biological systems. The pharmaceutical industry uses it heavily and it has become a dominating technique in biochemistry and molecular genetics. Keeps MIE buyers and online subscribers up-to-date with the latest research with this highly used technique. Provides tried and tested techniques which eliminate searching through many different sources. Biochemists, biophysicists, cell biologists, and molecular biologists.